Corning and Samsung have announced a new partnership between the two companies that will see Corning’s Lotus Glass technology utilized in upcoming OLED products from Samsung. Lotus Glass is said to be somewhat similar to Gorilla Glass but delivers higher processing temperatures and improved dimensional stability. First announced in October 2011, Corning’s Lotus Glass is designed to perform exceptionally well in low temperature manufacturing environments. This thermal consistency allows it to retain its shape and surface quality during high-temperature processing, guarding against thermal sag and warp which could ultimately ruin a display. In addition to the thermal properties, Lotus Glass is said to consume less power while delivering superior picture quality. The press release didn’t specifically outline how the glass would enable less power consumption but we have an educated guess. Most standard displays aren’t transparent – that is, the amount of light that exits the panel is less than what initially entered. Lotus Glass could be more transparent which allows for more light to pass through, ultimately meaning you don’t need to have the brightness set as high on the device to achieve the same level of brightness on a competing device. Less power of course means longer battery life. Although we don’t have confirmation on this, it’s very possible that Samsung used Lotus Glass in their Smart Window demo at last month’s Consumer Electronics Show. 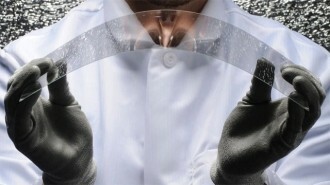 Samsung is planning to use Lotus Glass in a range of products from handheld and IT devices to large TVs and beyond. Samsung can additionally license the technology to other Korean manufacturers should they choose to do so.